On Sunday March 5th 2017, more than 1000 riders will pedal to power medical discoveries. 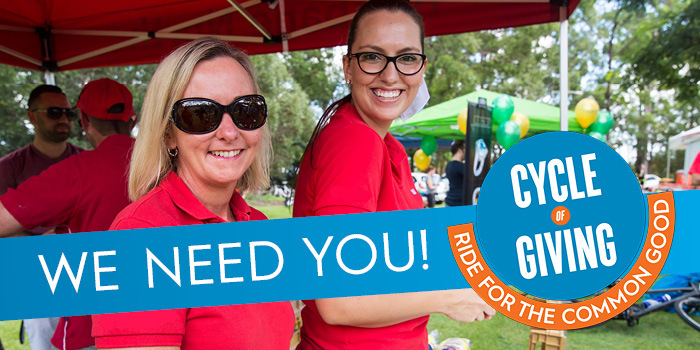 Riders will cycle 100, 65 or 25 kilometres all finishing at The Prince Charles Hospital in Chermside, and we will need over 100 volunteers to make sure they get there safely. We need you to help out! • Cyclist Shepherds/Human Navmans. You’ll provide direction and encouragement to the riders on the route as a road marshal. • Refreshment Specialists. Ensure our cyclists get their beverages and snacks in a timely manner at start and finish lines! • You’re fine on your feet. Road marshals will be stationed on the route for up to five hours – we’ll provide refreshments and sun care (and you’re welcome to bring chairs), but it’s important you’ll be fine on the route for an extended period of time! If this sounds like you and you have a few spare hours on Sunday March 5th 2017 to help make the Cycle of Giving our best event yet, head here to register.